A new Republican proposal unveiled Tuesday to offset sequestration’s impact on Defense Department spending would cut benefits to federal retirees and force current employees to contribute more to their pensions. Reps. Jim Bridenstine, R-Okla., and Doug Lamborn, R-Colo., will introduce the Provide for the Common Defense Act in an effort to roll back the budget caps put into place by the 2011 Budget Control Act that have led to significant cuts at the Defense Department. The bill would generate other savings in part by using a less generous formula for inflation -- known as the chained Consumer Price Index -- to calculate cost-of-living adjustments for federal retirees and Social Security beneficiaries. The legislation also would increase over three years federal employees’ contributions toward their retirement accounts from 0.8 percent of their salaries to 2 percent. Additionally, Bridenstine and Lamborn would eliminate the Federal Employees Retirement System annuity supplement, which provides extra benefits to certain employees who retire before they are eligible to collect Social Security. All three proposals were endorsed by President Obama in his fiscal 2014 budget plan. Citing Obama’s budget and estimates by the Congressional Budget Office, the Republican lawmakers said the chained-CPI conversion would save $216 billion over 10 years, while the retirement contribution increase would save $20 billion in the next decade. The bill would cancel the budget caps on the Defense side for the next two years, and ultimately save the government $200 billion in the next decade. In addition to the cuts to federal employee benefits, the bill would include Obama-budget provisions to cut Medicare benefits and crop subsidies. Obama has repeatedly said, however, he would only back these measures if they were coupled with new tax revenues. Bridenstine said it is critical to continue investing in our national security to keep pace with other nations such as Russia and China. 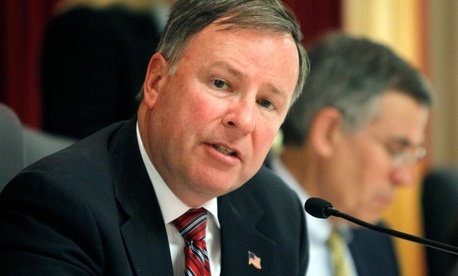 Lamborn added Congress should not target the Defense Department as a means to bring down the nation’s debts. Professional associations and unions representing federal employees and retirees, which blasted Obama’s budget when it was unveiled in April, have repeatedly condemned any effort to cut benefits as a part of a budget deal, saying their members have already sacrificed enough.